The lead was just 18 runs for the home team, which is 1-0 down in the series and needs to push for victory to get anything from the two-test contest. 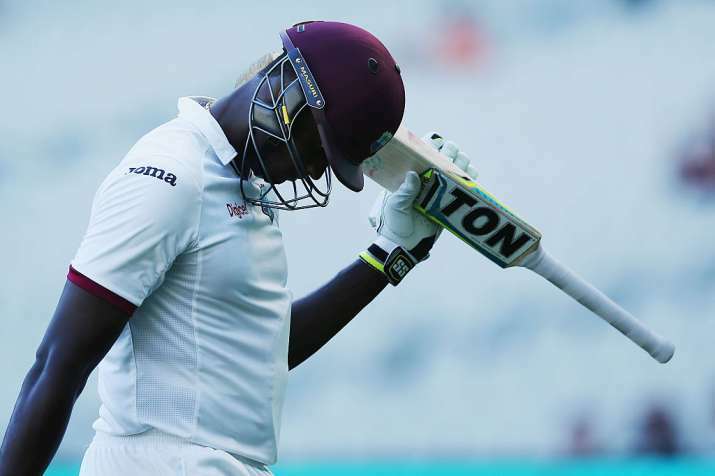 Image Source : GETTY IMAGES A file image of Jason Holder after being dismissed. Centuries from Jason Holder and Shane Dowrich at the tail end of West Indies' first innings took it to 448 all out on Day 4 of the second test against Zimbabwe on Wednesday. By stumps, Zimbabwe held a narrow lead but only had six second-innings wickets in hand at 140-4 and faced a challenge to keep West Indies at bay. The West Indies first innings was saved by captain Holder, who made 110 batting at No. 9, and No. 8 Dowrich, who made 103 for his first test century. Their eighth-wicket stand was ultimately worth 212, taking West Indies out of trouble at 230-7 to a position of control at 442-8 when the partnership was finally broken by Zimbabwe seamer Tendai Chisoro (3-113). West Indies was finally all out for a 122-run first-innings lead. While Holder and Dowrich put West Indies in control with that double-century stand, quick bowler Kemar Roach pressed home the advantage with two wickets in the first six overs of Zimbabwe's second innings. Roach (2-14) removed both openers and fellow quick Shannon Gabriel pitched in with the wicket of Brendan Taylor as Zimbabwe slipped to 46-4. Sikandar Raza led the recovery with an unbeaten 58, with PJ Moor alongside him on 39 not out. They pushed Zimbabwe into a narrow lead at stumps, but have plenty more work to do on the final day.